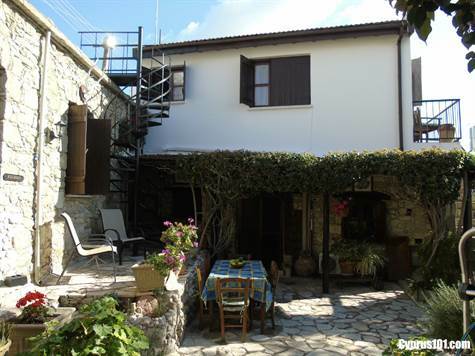 Mesa Chorio, Paphos District – This delightful Cyprus stone house for sale is located in the quaint village of Mesa Chorio, which enjoys both the charms of a Cypriot village and tranquil rural setting with the convenience of Paphos town which is a few minute’s drive away. The village tavernas and wine bar are within easy walking distance. The property was originally built about 100 years ago and tastefully renovated in 1992. L-shaped in design it consists of two wings, the one being single storey and the other on two levels. The lower level accommodation built in stone features a cosy lounge including feature fireplace and wood burner fire, dining and study area, large separate kitchen, double bedroom and modern shower room. The kitchen has plenty of fitted cupboards and worktop space. Appliances include built-in oven, gas hob, extractor fan, fridge/freezer and washing machine. The upper level accessed from an external stone staircase is an extension which was built in brick and consists of a further double bedroom and spacious bathroom. The private courtyard garden is an idyllic setting in which to enjoy outdoor dining and relaxing. A seating and barbecue area with pergola above enjoys stunning sea and rural views and there is scope to add an upper terrace above. The property is ideal as both a permanent residence or holiday home, is furnished and has full title deeds.